Just like many other components of your house, windows eventually need to be replaced. If you’ve been thinking about replacing your windows, our expert staff is ready to come out and give you a free consultation to see if replacing some or all of your windows is the right move for your home. Modern windows are much more efficient at keeping your house insulated and preventing the outdoor elements from getting indoors. Older windows can be prone to letting in more air and moisture to your home, which affects your overall energy costs. Think of replacing old windows with new ones as a long term investment in your home’s energy efficiency; it’ll end up saving you a great deal of money on your heating and cooling bill over time. Sometimes older windows don’t match the style of your home you currently have. There are numerous selection of styles that can add value to your house and that will match the overall look that you’re going for. New windows can be a nice visual upgrade to your home’s overall curb appeal. Your home is an important asset, and replacing your windows can be a great investment in the improvement of your dwelling. Newer windows won’t just look great, they’ll also instantly upgrade the value of your house. New windows have a number of benefits both for your home and for the environment. Replacing your windows will keep your home efficiently insulated, requiring less energy to heat and cool it’s indoors while requiring less of our natural resources to keep you comfortable. Beyond just looking good and being energy efficient, newer windows are often times more comfortable. You’ll be enjoying better insulation and moderated temperature in your home without spending as much money messing with the thermostat. Do you live close to heavy traffic areas, or do you hear outside noises often? Many times, along with being less efficient insulators, older windows aren’t as capable of reducing outside noise. One of the major benefits of replacing your windows is having a quieter home. This can create a more peaceful and tranquil environment in your household. Older windows can also be less capable of filtering out ultraviolet rays from the sun. A great reason to replace your windows is to get up to date window panes that filter out UV light. If you’re noticing carpet colors or furniture starting to fade that are sitting near windows in direct sunlight, it’s a good indicator that it’s time for replacement windows. Even if you haven’t started to notice colors fade yet, replacing your old windows with new ones can better protect your furniture from the sun’s rays in the future. Windows will eventually lose some of their ability to keep the outside weather from entering your home in the form of air and moisture. Over the course of years, temperature and pressure changes will expand and contract your windows and sooner or later this will wear down the sealing around the window frames. If you’ve noticed foggy windows that won’t seem to go away or feelings of drafts around the windows, it’s a good indicator that your seals are broken and need to be looked into. In the case of worn window seals, you might be able to fix the problem with a restoration, which we will gladly provide you. Other times, the window might be cracked itself or functioning improperly, and depending on the amount of windows, level of damage, and the work required, a full window replacement might be a better option. 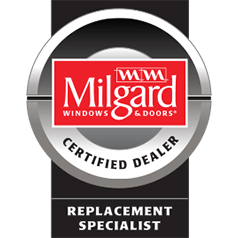 Our expert staff will be happy to give you a free inspection and can advise you on your best possible options for Milgard window replacement. Contact us today and our helpful and knowledgeable crew can provide you with a free quote for your Portland Window Installation upon request. We also offer one of the only true online price calculators. With just a little of your time and effort, we can provide you with a detailed accurate quote via email.